Today, Herbert Hoover – the 31st president of the United States (1929-1933) – is probably most associated with the onset and deepening of the Great Depression. Few know that prior to his presidency he was a successful international mining engineer (and had some lucrative investments in Russia before the Revolution), and later headed up the ARA (American Relief Administration), designed to deliver needed foreign aid to Belgium in the aftermath of World War I. What is more, as head of the ARA and then, from 1921, in the administration of President Warren G. Harding (who succeeded Woodrow Wilson in what is still the biggest landslide election in American history, after which his presidency spiraled downward into scandal) as Secretary of Commerce, he headed up the largest humanitarian aid effort in U.S. history to that point. In a massive campaign funded by a $20 million from Congress as well as plenty of private donations, the ARA in 1921 and 1922 aided a Russia torn by a horrendous famine, from which more than 5 million would die. As a result, some have claimed that Hoover was responsible for saving more human lives than any other person in history. Whatever the case, the ARA effort in Russia, lead by 300 Americans and over 100,000 Russians, in 1922 fed 11 million starving Russians in over 19,000 kitchens from the western borders of Russia to east of the Urals, battling against huge odds, including a horrible winter, decimated rail transport, and a less than cooperative Soviet leadership (Lenin was convinced that the ARA was seeking to support and build an anti-Soviet resistance). 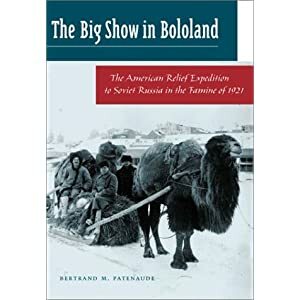 This fine documentary, based on The Big Show in Bololand, brings the ARA effort to life through amazing film footage and excellent still imagery. We meet a few of the Americans who led the effort, and learn some interesting facts – like that 10% of the Americans who went over to Russia for ARA came back with Russian brides. But the most fascinating revelation is that Hoover saw and sold the ARA effort not as a fundamentally humane/humanitarian effort, but as a means to subverting the Soviet state (which he loathed) – yet not in the manner which Lenin feared. Instead, Hoover hoped that if the common Soviets witnessed an efficiently run aid effort (and the abundance capitalism provided), they would be swayed by the superiority of the capitalistic system, tossing off the chains of communism. In short, the administration said that, while it sympathized with the plight of the Russian people, unless they changed their economic system, there was no reason to extend a hand in trade. Therefore, while the scale and effect of the ARA effort in 1922 was monumental and heroic, it is nonetheless worth considering if that effort might have been easier, less costly, and resulted in even more lives saved, if the U.S. had in fact negotiated a trade deal with the Soviets in the spring of 1921, before the worst of the famine had hit. The Great Famine is scheduled to appear on PBS Monday, April 11, 2011, on The American Experience. Check local listings for broadcast times.